This Saturday night, in the main event of UFC 230, Derrick Lewis will attempt to wrest the UFC heavyweight title from the waist of reigning champion Daniel Cormier. While the oddsmakers aren’t giving “The Black Beast” much of a chance in this fight, many people are hoping he pulls off the upset, having fallen in love with his hilarious personality and his thunderous knockout victories. Greg Hardy, who is perhaps known better for his history of domestic violence than his burgeoning MMA career or former football career, is hoping Derrick Lewis wins for another reason. He’s been called out by Lewis before, and he’s hoping that, if Lewis wins, he’ll get the chance to settle the score with him in the near future. Greg Hardy made a callout of Derrick Lewis on Instagram on Friday morning. “Ok ok ok, it’s about to go down baby. Who do you guys have. Let’s argue lol. I want The Fat beast to win so I can go show him a run in with me is broken bones and blood not bruises for that strap lol. #peaceintheviolence #princeofwar a prince can dream can’t he. And that way DC can go get fed to @jonnybones and we can start talk n bout super fight ” – Greg Hardy on Instagram. While Greg Hardy is hoping for a future matchup with Derrick Lewis, it’s worth noting that he’s not even officially a UFC fighter yet. The former NFL player is currently working on earning a UFC contract by fighting on the regional circuit, as specified by his so-called “developmental deal” with the promotion. If he can build an impressive enough streak on the regional circuit, the UFC will almost certainly add him to its heavyweight roster. 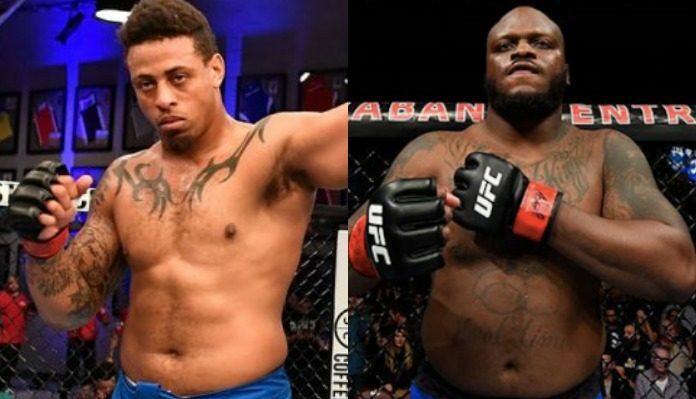 If Greg Hardy does sign with the UFC, Derrick Lewis has previously stated that he’d love the chance to punish him for his past sins. “He’s a wife beater, I’d like to get in there with him,” Lewis told TMZ Sports of Hardy earlier this year. “I like knocking wife beaters out. I’ll fight Greg Hardy. It’ll be like vice versa him beating on a woman. I’ll be beating him like he was a woman. What do you think of Greg Hardy’s callout of Derrick Lewis?